Yesterday got me pumped up about being in the Adirondacks. It’s amazing how a simple walk in the backcountry can get you fired up. It makes me look forward to doing more of it next year. This morning dad wanted me to accompany him to our old stomping grounds. 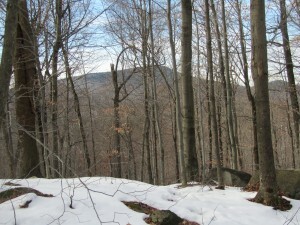 While he was going to hunt the top of the mountain I decided to wander around in the area around the “rock” which you might be familiar with if you read my first book. It’s just a place I like to go even all these years later. Shortly after the sun came up I heard some shooting come from the area where my father was headed. I clicked the radio on and waited. When he came on he told me that a few bucks were chasing four does around on the hill in front of him. 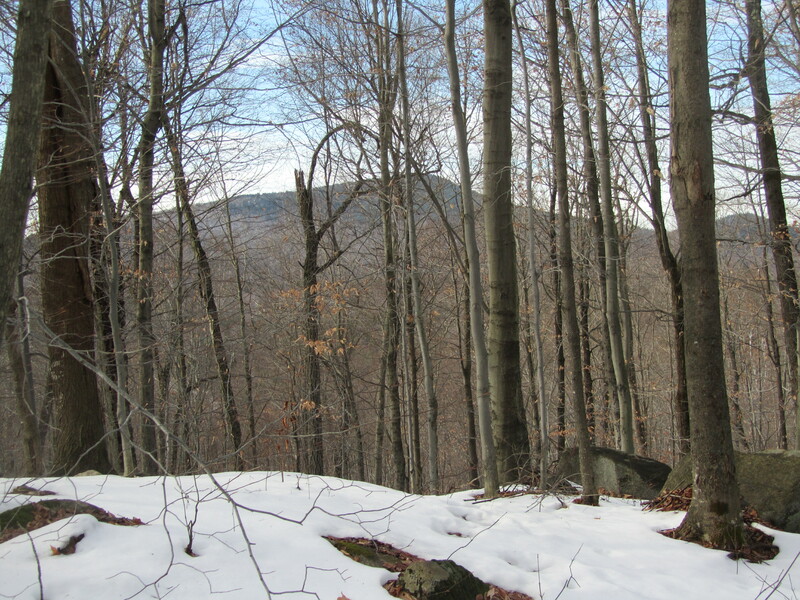 With the freshly fallen snow it’s easy to see well over a hundred yards in this area. He said one of the bucks was a really good one and the other ones were too far away to identify what they were wearing for headgear. 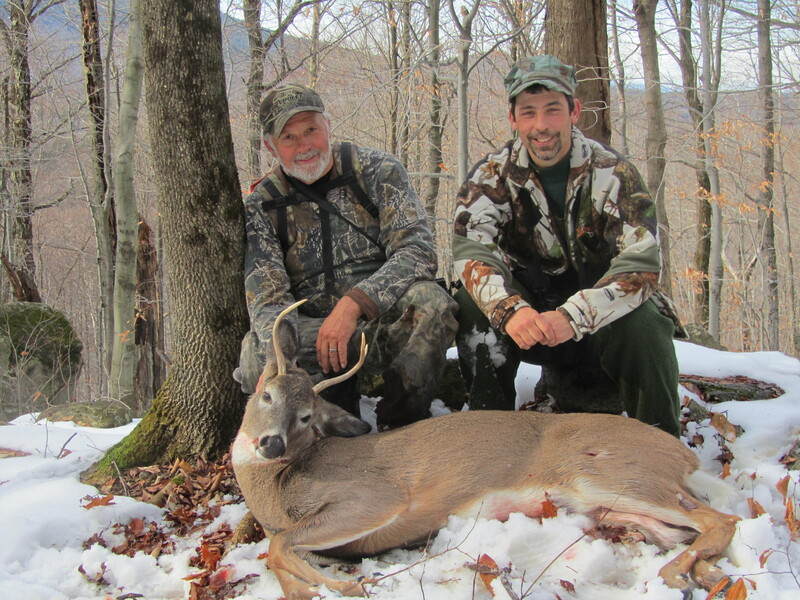 After he started shooting deer scattered everywhere, which is pretty amazing for the Northern Zone of New York since there are so few deer to begin with. He asked if I could come give him a hand because he wasn’t sure if he hit the buck or not. I pulled my binoculars up and quickly located the deer. As it turned it’s head and looked at me it was quite easy to see that it was a doe and I told my dad it was a doe. After a short conversation back and forth we decided to go see what we had on our hands. I went up one side of the hill and waited. Dad went up the other to go to the deer. About fifteen minutes later I heard a thunderous bang on the front of the mountain. Dad came on the radio and told me he jumped the buck he had wounded, but he only had one bullet left. It turns out the doe we saw with the binoculars was lying down in front of the wounded buck so we couldn’t see the buck. It was a tense situation for a few minutes, but it all worked out in the end. It just goes to show you that mistakes can and sometimes do happen. When I caught up to dad we started tracking the deer. After a couple of hundred yards we jumped it again. I got a good bead on it and fired, then fired again. The deer plunged forward to the edge of a steep cliff and expired there. I was a little disappointed to see that it was only a 3-pointer. We made quick work of gutting the deer and started dragging it so our buddies Doug, Steve and his son Jason could help us get it out of the woods. 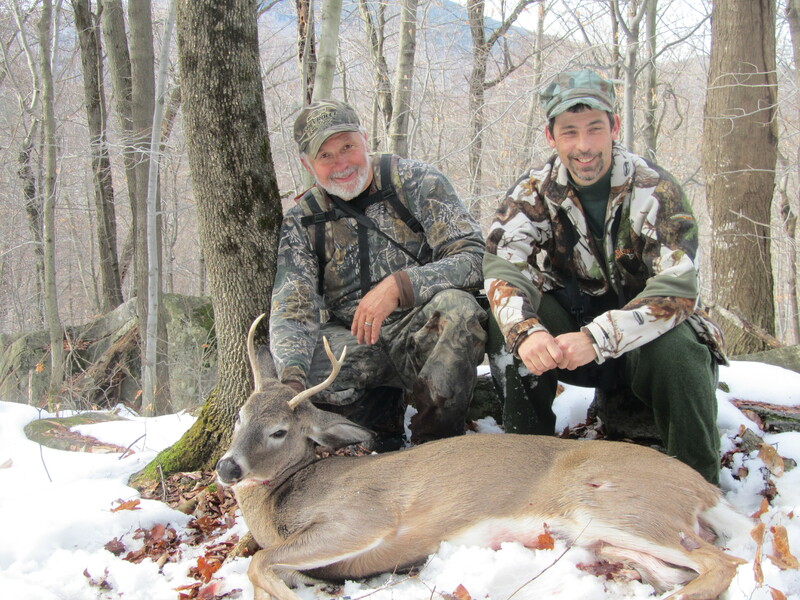 This closed out a good year in the Adirondacks for a very limited amount of time hunting. Although the big buck escaped unscathed this morning he’ll probably be wandering around the same area next year unless one of us gets a crack at him during late muzzleloader. I guess that’s the good thing (or we could say bad thing) about hunting in New York. It seems like we have an unlimited amount of tags. There's nothing like being in the mountains with your friends. A view from where the deer fell. This entry was posted on Saturday, December 10th, 2011 at 5:56 pm and is filed under Uncategorized. You can follow any responses to this entry through the RSS 2.0 feed. You can leave a response, or trackback from your own site.